Many Vancouverites are wondering what the City is doing to make Vancouver affordable and therefore liveable. Unfortunately, the City’s main affordable housing initiative over the past two years has produced no new affordable housing. Under the guise of a program supposed to “address the issue of rental and affordable housing supply in Vancouver,” the City has handed tens of millions of dollars over to real-estate developers through tax breaks in order to ‘incentivize’ unaffordable market rental development. It is but one an example of Vision Vancouver’s neoliberal approach to fiscal policy, pushing aside the interests of residents for those of big business. The policy in question is called the Short Term Incentives for Rental (STIR). It was adopted in June of 2009 with limited public discussion or consultation. Some residents have been fighting it ever since. When developers participate in the STIR program, the City exempts them from paying regular development taxes. Furthermore, the City allows the developer to rezone the property to allow higher more dense residential development, thereby greatly increasing the property’s value. In exchange for this, the only thing the developer is obliged to do is build for-profit rental housing. There are no caps set on the rent that can be charged, and therefore no assurances that the rental will benefit those who need it most. The idea of creating a tax incentive to stimulate real-estate development is not new. On the federal level, Canada used to provide tax incentives for rental construction through a special tax designation, known as ‘Multiple Unit Residential Buildings’ (MURBs). It allowed real-estate developers to claim the entire depreciation of their buildings at the start of construction as a non-taxable expense. The program was ended in 1981. While developers were quick to take in the tax cuts through the program, only 20% of the projects were actually being finished. Around the same time, tax incentives were proposed in Vancouver to increase the affordable housing stock. The existing Housing Planner Ann McAfee was quick to point out, however, that it was “easy to make a case to reinstate tax incentives for new rental housing. Easy, that is, if you don’t ask who is helped and who is not.” She went on, “there is considerable evidence to suggest that if the objective is to provide affordable housing to the average renter, we should target the subsidies directly to the renter through shelter allowances, and build non-profit housing.” Because of her objections, as well as others, a tax incentive program was avoided. When STIR was passed by Vancouver City Council on June 18th of 2009, the question of “who is helped and who is not” was studiously ignored by the ruling Vision party. That the STIR program results in foregone income for the City, entrenching the regime of austerity at City Hall, was not discussed. In fact, very little was discussed. The policy was presented to council as a late-distribution report (which means the public was not given the normal two weeks notice to prepare and organize for or against). Attempts by Councillor Ellen Woodsworth to postpone the meeting were shot down by Vision. As has been pointed out by others at the council meeting, Councillor Geoff Meggs put up the argument that “the consultation was the election,” and that any further discussion wasn’t warranted, despite the fact that members of the public had only been introduced to STIR a few short days beforehand, long after the elections. Councillors Woodsworth and Anton voted against the proposal, with Councillor Cadman absent. Vision, voting as a bloc, were in favour. According to Vision, STIR was a response to the “short term economic recession” of 2008. The housing collapse of that year, however, was in fact spawned by the same deregulation of the housing market proposed under STIR. Further, Olympics boosterism and a rock-bottom tax rate kept condo construction up throughout the Lower Mainland despite the US-led recession. If STIR does not produce affordable housing, why was it implemented? The main reason is that Vision Vancouver, elected in 2008 to a fanfare of environmentalism and ‘progressiveness’, needed to start paying back the business elite and real-estate developers that financed their campaign. The 2008 civic elections were the most expensive in Vancouver’s history, made possible by donations from unions, big-business, and most significantly, real estate developers. An understanding of STIR requires a brief look at real-estate economics and an introduction to how City Council regulates development in the City. Urban residential real-estate is a unique type of market. New land cannot be produced, but multiple homes can be built on the same piece of land. In general, property values in a City rise and fall together. Individual properties increase relative to others when the potential profitability of development on the site increases. Profits for developers do come from the purchasing and reselling of capital in the traditional sense, but also come from general increases in the value of the land. Upzoning, which increases density and/or height on a site, increases the value of land holdings. Construction of amenities, such as pools, libraries, and community centres, also increases the value of land. The important thing is that both of these are regulated by City government; the developer doesn’t have to do anything to earn these increases in value. Because it would be unfair and corrupt to give developers money for doing nothing at the expense of the citizenry, these increases in value are supposed to be taxed. In other words, the City has the direct ability to increase the value of land, which is why developer contributions to municipal political parties amount to a daunting conflict of interest. Taxing the increases in the value of land is a major source of revenue for the City, amounting to tens of millions of dollars annually. This money is most often used for amenities, such as social housing and libraries, which the City needs to accommodate the increase in density. These taxes also control the type and amount of real-estate that is built. Foregoing these taxes turns real-estate into a free-market. It also means money that would go to the City is kept by developers. Decreasing taxes hasn’t led to more affordability, but it has drastically increased profits for developers, and decreased the City’s income. While the City has no shortage of potential revenues with which to build social housing or expand its housing subsidies, it gives money away to the largest corporations and claims it can’t afford to solve the housing crisis. For the purpose of this initiative, “for-profit affordable rental housing” is to mean “three or more dwelling units designated for new rental housing subject to the provision of a legal agreement between the City and property owner to secure the rental housing units”. The universally adopted definition of affordability is: one third of the inhabitant’s income. These units are not affordable. We do not need more luxury housing in Vancouver. One in seven Vancouverites spend more than 50% of their income on housing. One in three residents spends more than 30% on housing. Despite all claims, the STIR program is not designed to build affordable housing. It is designed to take money from the public and give it to Vancouver’s wealthiest class. Taxation at the City level is regulated by the Vancouver Charter. In addition to property taxes, the City taxes new developments. The two most significant such taxes are Development Cost Levies (DCLs) and Community Amenity Contributions (CACs). DCLs are taxes payed on the square foot of development. For most developments larger than a detached home and all commercial develpments, the current City-wide rate is $10.42 per square foot, but can vary by neighbourhood. CACs are amenities, such as libraries, pools, daycares, parks, etc. that are built by the developer. An example of CACs can be seen at 1 Kingsway, which is the new Mount Pleasant Community Centre. In that case, the developer payed for the City-owned daycare facilities in exchange for additional density above the previously allowed zoning limits. Through the STIR program, the City waives a portion of the Developmental Cost Levies and Community Amenity Contributions proportionate to the amount of market rental units included in a project. When the developer wants additional density, which usually means a higher tower (with better views and therefore more expensive suites), they propose adding STIR to their project and ask the City for a rezoning. Returning to our previous examples: at 1142 Granville Street, the City waived and estimated $638,000 in DCLs. The development will have 106 units that are about 320 square foot, which will rent at $960 per month. That is a subsidization of over $6000 per non-affordable unit. At 1650 Quebec, the City waived DCLs of $1.5 million dollars for 91 units, a subsidization of almost $17,000 per unit. There have been dozens of these projects throughout the City. Providing tax incentives to developers isn’t working and can never work in Vancouver because traditional ‘supply and demand’ theory does not explain Vancouver’s real-estate market. In theory, prices are pushed downwards through a competitive market structure. However, there are very few real-estate developers with sufficient capital to plan large developments of the type for which STIR was designed. These developers set the price and pace of housing construction, based on maximizing profitability. It is in their interest to slowly release the land holdings, keeping the price high. They act as a oligopoly, and display characteristics of a cartel. Buildings that cost the same amount to build as they did ten years ago (or less, through STIR), are being sold at two to three times the price. Adding to developers’ profits with a tax incentive does nothing, since together they act as a monopoly and will produce the supply that maximizes profit, as opposed to producing where the marginal revenue from building equals to the marginal cost (as in a competitive market). Part of the increase in housing prices has been caused by speculation and the purchase of secondary homes. Because of the huge disparity in wealth in Vancouver, some owners are able to buy many units while the majority of residents can’t even dream of buying their own home. Most new condos in the city are not part of the STIR program, but are being rented out anyway. In Council on June 16th, Anton remarked that after speaking to some of her “developer friends”, she had been led to believe that 30 to 40 percent of new condominiums built are being rented out anyways. If this is true, it renders the STIR program irrelevant. City Council has the ability to regulate the use of land through taxes and zoning bylaws. The market for development is managed with these controls, but our current Council has all but abandoned those tools. Through STIR, Vancouver real-estate has been pushed closer to a free market, which has caused home prices and developer profits to surge. Leading up to implementation of the STIR program, affordability was maintained by building social housing, funded partially through the Development Cost Levies that are now foregone. While City Council, led by Vision Vancouver, has argued it is not their responsibility to build public housing, we are far behind other cities. 41% of the public housing in Toronto is owned by the City and not the provincial or federal government. The STIR program explicitly (page 3) places the priority of new, for-profit rental housing above the building of social housing. So far, despite the fact that the NPA’s campaign has seemingly moved into full swing, there has been no discussion of housing. Affordability has been, poll after poll, the number one priority for residents. The NPA has been uncritical of STIR because, as with Vision, they are a neoliberal, pro-developer party. Their backers benefit from the STIR program. The number one priority of residents will stand unaddressed as long as either of these two parties maintain a majority. Joseph Jones, The Ugly Story of Short Term Incentives for Rental. Aug 2010. Vancouver Media Co-op. Posted in Analysis, City Hall, Gentrification, Housing, Mount Pleasant, News. Bookmark the permalink. (1) As far as I know, opposition councillors and the public had less than 24 hours notice of STIR coming before Council. (2) The STIR proposal traces straight back to Vancouver City Planning Commission. Current NPA Council candidate Mike Klassen was setting agenda for the Commission at that time. This is an excellent analysis of the STIR program – and the West End Neighbours are solidly behind you as we have been struggling for a year and a half to let people know about what this means in our community as they try to force these new STIR developments on our neighbourhood. The proposed STIR developments in the West End have tended to target heritage and church sites where purchasing costs are relatively low and the value of these sites to the community are high. And even with close to 12,000 people signing a petition saying no new developments until there is a community plan, they forge ahead to satisfy the insatiable appetite of the developers. Another insidious issue about affordability is that it is illusive, ill defined and relative to a person’s income. What is affordable to the City Manager’s annual salary at 30% of $300,000 plus annual salary or the City’s Director of Planning’s salary of $200,000 plus annual salary is quite different from a person’s income of $13,000 or even $30,000 per year. So what is affordable in the real world really has to do with how much money you make. Pure and simple. Yet we get caught trying to defend ‘affordable’. It is time to stop and to actually put some markers in the sand. And we need to challenge the City on what it means and who benefits. STIR is a blight on neighbourhoods across the city from east to west. Joseph, in this case I’d say Vision isn’t equal to the NPA, they are decidedly much worse than the NPA. At least the NPA did not allow developers to shortchange residents on community amenities in exchange for padding their wallets. Why doesn’t the city waive all permit fees for homeowners installing a basement suite? And seriously, who on Earth considers $900/month for 320 square feet affordable? 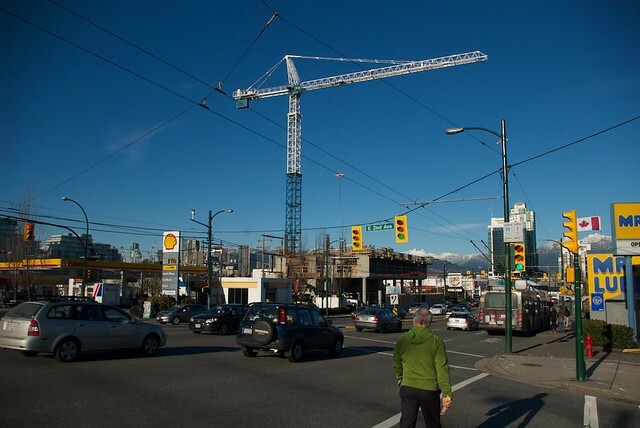 It seems that the developer corruption is rampant in Vancouver and elsewhere. It would be nice to get rid of these politicians that do the bidding of the corrupting developers. There are a lot of developments in and around Vancouver that epitomize corruption by cheating their employees of just wages and making them work overtime for straight time pay. Were we in the US these people would be in criminal court on RICO charges. Racketeering for organized crime seems to be acceptable in BC. I am sure that the minuscule places that the developers plan for the ordinary folk would fit well in their bathrooms. They act as a monopoly? Not quite. You’re neglecting zoning in Vancouver – in nearly every location, it’s illegal to build additional housing units until marginal revenue equals marginal cost. Ed Glaser’s excellent paper “Why is Manhattan So Expensive?” for a more thorough examination of the effect of density-limiting zoning on housing prices. As pointed out in the “Further Reading” article by Joseph Jones, a pro forma analysis of one STIR project had expected profits calculated at 83-119%. Normal profits for a developer are 15-20% (although I’ve heard that that’s going up). The STIR policy does have some discussion of “undue profit”, but this has as yet been undefined. Councilor Woodsworth asked them to define it for the 1650 Quebec site when it was at council, and they couldn’t. Apparently it’s been an ongoing problem. The Vancouver Real-Estate market is really weird, and there hasn’t been nearly enough academic discussion of it. I haven’t heard that marginal cost must equal marginal revenue according to zoning laws, but I’ll look into it. I know that the 15-20% profit is for the risk the developers take on, but how risky is building a luxury condo? As far as I can see there is a really concentrated market structure for the large developments where most of the building is happening in Vancouver. There aren’t very many developers. From what I can see, though, there does need to be more data to figure out what’s actually going on. If the STIR profits are real, simple laws of economics would say all developers would be heading there to realize profits five times their norm. As far as I can see, there are only a few of the large developers heading in that direction and willing to shoulder the risk. With respect to the “normal” margin of 15-20%, those numbers are reasonably accurate however, you need to put them in context. First, that is the proforma number and rarely does the project end there – more often than not it is lower. Second, Banks won’t finance a project with a lesser margin because they understand how risky development inherently is and look at the margin as protection against default. You only need to look at the number or projects that have/are in receivership to understand that not all developers “get rich” off every project. Lastly, even for an established developer, not all projects are successes. So, the average profitability of a developer is far lower than the numbers listed above. In simple terms, the two that work pay for the one that doesn’t. Are there bad developers, absolutely; just as there are bad operators of social housing. Crooks and incompetents are not limited to the private sector. However, we still need someone to develop and build our houses and I personally would prefer a private enterprise over a crown/city corp to handle that task. I’m hopeful that come the next election, COPE and NPA councillors will have a combined majority on Council, and make common cause to kill this program, even if they dislike it for different reasons. Affordability is simply an euphemism for ‘one day you’ll own your home but not too soon’ kinda thing. There are people out there especially behind the bureaucratic curtain, well paid and fed that thrive on messages like this. If you read some of the reports you may get a headache. “More expensive”,in Bob Rennie’s sales pitch have become, “But still affordable considering”. IMO, this type of approach coupled with what I can only see as a City Approved Developer’s Slush Fund will be the beginning of the end for ‘affordable’ housing in Vancouver. In my experience, you give anyone, anyone in any business you can think of, more money to keep… and they will keep it all! Guaranteed. And as the story goes,courtesy to Vision Vancouver, now, development in the city have become more ‘affordable’ for the developers. Great analysis Sean. This was a hell of a concise, crystal clear, well researched piece you put together. If we could only find a “professional storyteller” to spread out the message around the Vision’s square minded table. We live in Vancouver and this keeps us busy. Great article, Sean. My nickname for it is STIR-fried”.